A 40 yo married female with history of recent seizure, the reason for her this neurological consultation for first time. According to her this was second episode of seizure. 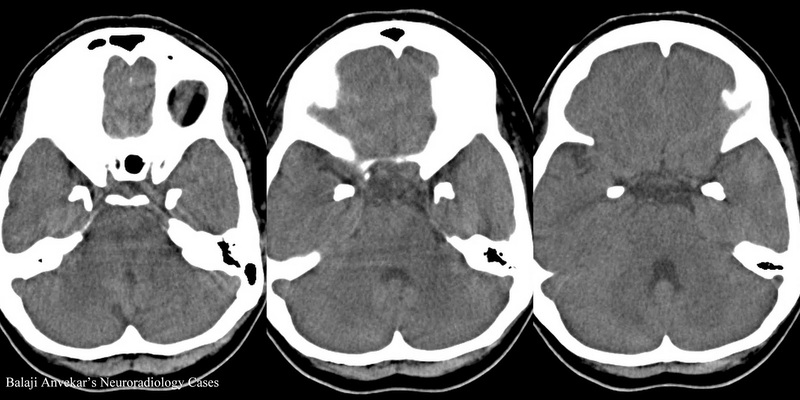 CT study of brain shows bilateral symmetrical horn like calcification of medial temporal lobes. Rest of the brain parenchyma unremarkable. In this case the imaging findings being very typical assisted in clinical diagnosis of Lipoid proteinosis. 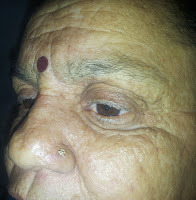 The retro grade clinical examination revealed an associated skin lesions as thick rough skin, blapherosis, papules, hoarseness of voice which is progressive as per history with episodes of seizures. Syn : Urbach-Wiethe disease, initially described by Urbach and Wiethe in 1929 as “hyalinosis cutis et mucosae”. A rare genodermatosis characterized by multisystem involvement due to intracellular deposition of an amorphous hyaline material. Caused by mutations in the ECM1 gene on chromosome 1q21. Normally EMC1 gene is expressed in the dermis, basal keratinocytes, endothelial cells and developing bones and is linked to keratinocyte differentiation, basement membrane regulation, collagen composition, and growth-factor binding. The mutated ECM1 gene gives rise to hyaline material deposition in the dermis and thickening of the skin and mucous basement membrane around blood vessels and adnexal epithelia. The patient may present with abnormal scarring and wound healing. Premature skin aging, skin and mucosal thickening usually the first clinical manifestation. Moniliform blepharosis is considered a pathognomonic finding present in 50% of patients. Associated hoarseness is present at birth or in the early infancy in two-thirds of patients, due to early hyaline material larynx infiltration, progressing with time. When CNS is affected, a wide variety of neurologic abnormalities may be present. The hallmark findings are calcifications, mostly occurring in the amygdalae, hippocampus, parahippocampal gyrus, or even the striatum. CNS infiltration occurs predominantly around the hippocampal capillaries, resulting in wall thickening, which later progresses to perivascular calcium deposition. Neurologic manifestations range from migraine, variable degrees of mental retardation, seizures, depression, anxiety, and panic attacks to disturbances in decision making, memory, and abnormal social interaction patterns. In half of cases imaging assist in the diagnosis and gives clue to the diagnosis because there are few diseases that can manifest such a typical pattern of bilateral and symmetrical calcification occurring in the medial temporal lobes. Amygdalae involvement is considered pathognomonic. Reference : American journal of Neuroradiology, Amygdalae and Striatum Calcification in Lipoid Proteinosis F.G. Gonçalvesa,b, M.B. de Meloa, V. de L. Matosa, F.R. Barraa and R.E. Figueroac.